Celebrating your first holiday season as a proud parent? 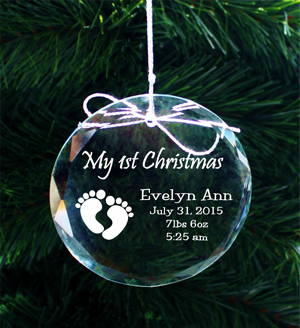 Commemorate the occasion with a customized baby’s first Christmas ornament from Frederick Engraving. As excited new parents ourselves, we designed these ornaments and still handcraft each one in our studio with care. Our personalized Christmas ornament range has grown to include dozens of options. Options include engraved wood Christmas ornaments with child’s name and birthdate handmade in a variety of shapes and designs. Other options include lucite for a crisp and minimalist look. We also have several whole family ornaments, to track your family’s growth through the years. All of our custom Christmas ornaments are handmade with pride. To order your personalized baby's first christmas ornament, just visit our website and select the design you would like. Enter the information (name, dates, phrases, etc.) as you would like them to appear and complete your order. That is it! We will craft your ornament with just what you want. Our personalized items typically ship in 2 to 3 days, and if we are out of stock of an item needed to make your order, we will clearly indicate it at the time of ordering. Frederick Engraving offers many other custom Christmas ornaments as well. These include family ornaments, custom laser cut name and initial ornaments, and memorial ornaments for our loved ones who are gone but not forgotten. Our other offerings range from color printed golf balls, to etched pint glasses, to engraved photo frames, to laser cut acrylic monogram charms. Whatever the occasion, Frederick Engraving has a custom item that is perfect (and perfectly thoughtful). Visit our website or Etsy store today to see all we have to offer.